Spring Cleaning! There are 3 green dragonflies at the top of the shade. This is for the shade only. 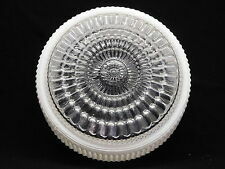 Tiffany style stained glass shade is 8" across x 4 3/4", hole at top is 2". Tiffany style stained glass leaded glass flower design lamp shade. Pre-owned, great shape. Top hole opening is 1-5/8” and bottom opening is 7” wide. Lots of colors, purple, red, green, blue, orange & yellow. There are a total of 12 shades being sold in lots of four. These shades were donated as a part of a fundraiser to benefit Sacred Heart Church, New Carlisle, OH. Tiffany Style Multi-Color Stained Glass Lamp Shade 13 1/2"
Set of 4 matching Antique Art Glass lamp or light shades. All shades are clearly marked Krakno. The only defect is on 1 shade only, small chip at the bottom edge which I did show in the pics. The set also includes 2 Krakno fitters that have a patent date of June 7, 1910. 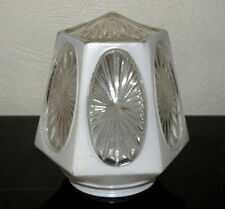 Antique Vaseline glass lamp shade. Great decoration, super colors, Salvador Dali enters my mind when I view the shade. Pics show the shade under a black light, glows nicely. Fitter is 5 3/8. Top hole OD is 3 3/8", ID is 2 13/16", height is 4 1/8". Perfect for wine cellar. This piece has clear leaves and grapes rather than the frosted. Stunning even when not illuminated. The shade shows wear typical of age and use and will need a cleaning. Maybe a few flea bites with typical nicks to leave ends. Our glass is decorated with iridescent colors, a technique very popular and widely used by glassmakers in the Art Nouveau era. Small air bubbles may occur as a natural result of the 100% handmade process. It is very insignificant. They are 5 1/2" tall, 4" wide with 2 1/4" fitters. I try to describe any obvious faults as truthfully as I can. Condition: very good original, as is on photos. There is a small glass flake on the fitter's rim. 384 pages of all things electrical 80 years ago. Tools, toasters, fans, condulets, shades, bulbs, waffle makes, wire, boxes, fittings, etc. Avery beautiful PAIR of TWO antique Fenton hand blown glass lamp shades. Lovely swirl pattern to the glass, nice soft pale amber peachy color, ruffled crimped edges, and a very think fine glass. Excellent, no flaws. Pair of Antique Frosted / Etched Glass Shadea for Victorian Gas or Oil Fixtures. No major flaws can be found. See Photos. LAMP SHADE is a rare mica shade. THESE ARE PROBABLY 50 TO 60 YEARS OLD. 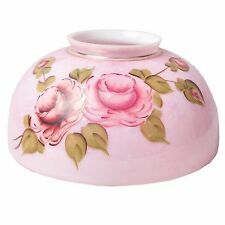 Hurricane Glass Lamp Shade / Flowered Design ! It is in nice condition and is 6 3/4" across the bottom and 6 " across the top. 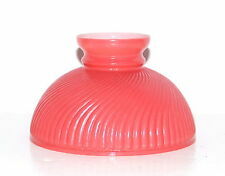 Victorian Duplex Kerosene Oil Lamp Top Etched Cranberry Orange Clear Shade 4” Fitter STUNNING !! Antique Art Deco Lamp Shade - Landscape with Nudes on waters edge. REVERSE PAINTED LANDSCAPE & NUDES / FLOOR OR TABLE . 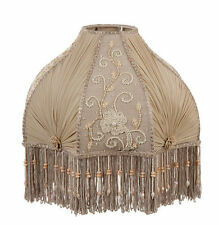 ANTIQUE ART DECO LAMP SHADE . 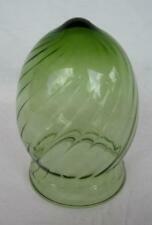 Great for a floor or table lamp. Shade is painted on both sides. Also the colors are beautiful and has no scratching of paint loss. It is signed and has the catalog number on the inside rim. The circumference is 36 3/4" around and the middle and about 5 1/2" tall. Perfect for wine cellar. The shade shows wear typical of age and use and will need a cleaning. Maybe a few flea bites with typical nicks to leave ends. Displays beautifully. Fine addition to any collection. Great Antique Condition. Tall X 4.75 In. Highlighted in a gold gilt paint, the shade has a narrow opening at the top and a larger opening at the bottom. Shade only with brass crown. A truly lovely addition to any lamp or decor. do not generally double box. Has a Art Deco style. The glass has a bit of a Amber hue to it, its very thick and heavy, approx. has a rain type of effect to glass with a lot of grooving or texture to it. Its shaped like a flower. Originates from an estate collection. I try to describe any obvious faults as truthfully as I can. Condition: Original condition as is, a small chip on fitter's edge. 3" TALL X 4 3/8" DIA.1 1/4" DIA. HOLE 1 3/8" RIM FOR CUP. The Base of the lamp has a touch of blue. The glass shade is plain satin. Lamp does work. The extra long original cloth cord is fraying. Original decorative finial included. SIZING: HEIGHT FROM TOP OF CELING BASE INCLUDING CHAIN & SCONCE IS 103", TOTAL HEIGHT IS 60", SCONCE ITSELF IS 50", 21" AROUND AT MID SECTION, 28 1/2" AROUND AT TIP OF POINTS, WALL MOUNT IS 5 1/2" ACROSS & STANDS OUT 1 1/2" FROM THE CELING, 6 PANELS, 6 SHARP POINTS. You can buy 1,2,3,4,or all 5. It has been black-light tested and glows in terrific color. I try to describe any obvious faults as truthfully as I can. Condition: very good condition. It has frosted and clear rippled sections and really looks Art Deco.